I have wanted to build one of these for some time. I purchased the spindle sander recently and got just the extra motivation I needed. The cart has a 1/2 steel rod in the center of the top and swivels with star bolts locking it in place when the tool is up. I really like having the tools ready to go when I need them. Should speed up my product process considerably. I really dreaded moving the planner out of the shed and finding table space for it in my small shop. When it was all done realized it was same size as two burner grill makes a great cover. You really need a drawer in these things since your tools (on the sander) all fall out when you flip it to the bottom. Nice work I have had mine for some time now an love it…. Very useful in a small shop. I know what you are saying about the drawer…......spindles go flying everywhere when you flip the sander over. Very nice looking one. I also have a need to build one or two of those, too many tools in to little of a room. very nice looking and simple compared to some that ive seen. What material did you make it out of? That looks like solid wood as opposed to ply. It also looks thick! The sides are douglas fir 2×4’s in basic frame and panel construction. The top, bottom and shelf are maple ply 3/4” with 1/8” maple faces. (Dad always said if its worth doing its worth doing right). 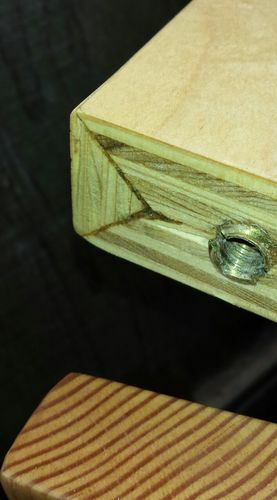 Drawer is made of the same maple ply with maple facing on the top side. Fun part was the dip in the middle for a handle. My son and I debated how to bend the 1/8 maple face for the top of the drawer front. My plan was to put them in the hot tub at 104 over night then clamp them in place for 2 days to dry to the form. Worked very well and they fit nice. I did have to make a call to hold it down tight during glue up. Spindle sander was great for that. On the top I mitered 2 3/4 plywood slabs then created a triangular miter to fit the V faces, the miters created. Worked out great thanks to a Wixey gauge I use on the tablesaw. That is really nice. I have been wanting to build one of these for some time now. I think you gave me the motivation I have been needing. That’s a nice set up! Very functional. So … one of your wood working tools is a hot tub? I might have to invest in one of those. yep, another project added to the list. You pulled this off well. Thanks for posting this. If you had to choose between a hot tub or a steam box, really which would you choose? Ron, that will be a great addition to your shop. Congratulations.